Root Beer Floats with Homemade Hot Fudge. I should preface this by saying that I’ve never really been a fan of root beer. Then Wednesday happened. I was walking through Target and happened to spy a 6-pack of bottled root beer. I don’t know if it’s the fact that I love drinking out of a bottle, or the fact that I can’t ever leave Target without spending my entire life’s savings, but I giddily grabbed the 6-pack and started walking down the aisle. Then the handle broke. That sure was fun! It was there, as I was standing in a sea of carbonation up to my ankles that I decided I could not leave without picking up some ice cream. Because at this point, I knew exactly what I was doing with that root beer. The 6-pack that wasn’t shattered into a million pieces, that is. What is up with me and glass this week? After getting home, I realized the chocolate cravings were in full force and I could either whip up a batch of homemade hot fudge, or eat 16 handfuls of chocolate chips. Hot fudge sounded so much better. And it’s so simple! Can’t pass on that. Plus, it’s a perfect Valentine’s Day treat. It can serve multiple purposes. I scooped some ice cream, dumped in some warm hot fudge, poured in some root beer, then died and went to heaven. Just so happens I’m sort of obsessed with root beer now. Oh! I almost forgot to mention. If you want to make this float a little more adult-friendly for Valentine’s Day, you can add a little something extra. To all my fellow root beer haters: you must try this. If I were you, I wouldn’t even be able to wait until Valentine’s Day. You shouldn’t. I accidentally ate this for lunch. I was only going to take a taste, but then one spoonful turned into two, and two turned into twenty. This isn’t even my kind of dessert. And I don’t like carbonated beverages because they hurt my throat and ears. Don’t worry… the ice cream makes it all better. And the hot fudge? Well… the hot fudge completes me. Scoop equal amounts of ice cream into two glasses. Top with a bit of hot fudge, then pour in root beer. Drizzle a little more hot fudge over top. Devour. Die. Go to heaven. Combine sugar, cocoa, salt, and flour in a bowl or pot over a double boiler. Bring water or milk to a boil. Gradually add hot liquid to sugar mixture. Stir constantly until mixture thickens. Once it has reached the desired thickness, remove from heat and stir in butter and vanilla. Serve immediately if you would like a thinner sauce, or let it sit at room temperature for an hour to thicken. Store in the refrigerator. Yeah. Wednesday was the best day ever. 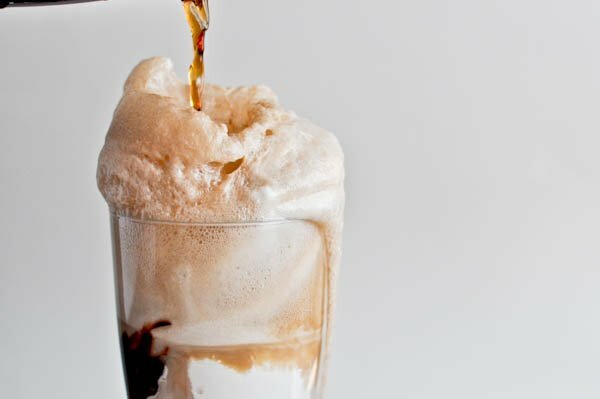 Root beer + Captain Morgan’s + butter pecan ice cream = killer grown-up float! It might not have the fudgy goodness of yours, but it’s oh so tasty. Try it! You so should have used Scotch instead of vodka! WOW. Looks delicious, and the photos are great! What type of camera do you have? This looks and sounds absolutely amazing. We think alike. I am going to try this. Love Root Beer, love chocolate even more and ice cream is a given. for those looking to trim some sugar cals…..make a ganache instead…..now you can have all that wonderful chocolate and call this the 5th food group drink! made this the other night. the speed with which i slurped it down was both astounding and embarrassing. I made these today at my husband’s request. They are amazing! Thank you for an awesome recipe! YUM!! I just died and went to heaven! OMG Im ready to leave work and hit up target for some root beer like now. This. Looks. Delicious. The hot fudge looks amazing, and everything is so foamy and drippy! Now, by 1 cup of cocoa, you mean cocoa powder right? Sorry, just don’t want to make any stupid mistakes :P Again, this recipe looks fantastic!